TheGunBlog.ca — Bill Blair, the Canadian minister examining gun bans for hunters and sport shooters, said ending home firearm storage and requiring central storage may be possible “in some jurisdictions,” a hunting and fishing club reported last week after a video meeting with the minister. This marks at least the third time in less than two months that Blair or a government official has mentioned new storage laws in what may be a hint of new measures to be aimed at Canada’s 2.2 million licensed shooters. The minister could announce bans on guns, on home storage, or other plans at any time. It’s already a crime to store firearms loaded and ready for use. Guns must be unloaded, disabled and in many cases locked up, or the owner risks being locked up. “The Minister’s primary concern regarding lawful firearms owners revolved around the issue of safe storage, believing the prevention of firearms theft is a key method of deterring and preventing violent crime,” the Port Coquitlam & District Hunting & Fishing Club said on its website Jan. 25 following a conference call with Blair on Jan. 24. Prime Minister Justin Trudeau directed Blair in August to study a “full ban” of the handguns and what he called “assault weapons” owned by licensed men and women. All guns are banned already for anyone without a permit. A public-relations firm that advises the government has said new restrictions present an “untapped opportunity” for Trudeau to win re-election this year. He is preparing to pass Bill C-71 as a new law against hunters, farmers and sport shooters. Blair and colleagues are meeting with experts and stakeholders across Canada, and “the Minister is hoping to complete his report of all engagement efforts, which will be made public in early 2019,” Marie-Emmanuelle Cadieux, a spokeswoman for Blair, said today by e-mail in response to questions from TheGunBlog.ca. She didn’t comment on any policies being considered. Criminality. Easy target for gangs to get thousands of guns at once. Casualties. The nighttime security guard will have a short life expectancy. Firearm owners who count on their gear for home defence will be vulnerable. Costs. High cost to build, manage, insure and guard. Who will pay? Closures. Clubs and ranges will close rather than take on the risk. Confiscations. Easy to get all guns at once in any future confiscations. Cleaning. Will shooters be forced to clean their guns at the storage locker? Cancellations. Shooters are already cancelling or postponing new purchases because of legislative uncertainty. Blair said Jan. 18 he aimed to announce his plans in “coming weeks,” CBC News reported at the time. The government is backing away from new gun bans and will consider ways to criminalize shooters who keep their guns at home, the Toronto Star reported Dec. 6, citing an unidentified government official. One idea being considered is forced storage at shooting ranges, the paper said. The Kenora Daily Miner & News said Dec. 4 that Blair was looking at new storage laws. The idea has been discussed in his consultations across the country. Canadian police and military, which have practised central storage for decades, have recorded more than a thousand lost or stolen weapons, based on data compiled by Dennis Young, a former federal-police officer and legislative staffer who now focuses on research. The 40-minute call with Blair included Donald Sohm, a member of the Port Coquitlam club’s executive committee, Larry Wilkins, a club member, and Ron McKinnon, a member of parliament, said the club. “We told the Minister that the Club did not support this idea of ‘central storage,’ as it would make clubs like ours a magnet for criminals that wanted to steal guns and would clearly be onerous for even large clubs such as ours,” the Port Coquitlam club said in its report. Share this article with your gun club and target range. Invite local politicians and media (newspaper, radio, TV, bloggers) to try shooting at your club or range. Central storage would be disasterous from a security perspective – a one-stop-shop for criminals. Or is there some super-secret strategy that Minister Blair has that will make it all magically work? If you’re reading this, it looks like you want the full picture. 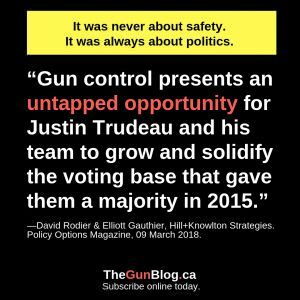 Subscribe to TheGunBlog.ca.